Clarinetist and tenor saxophonist Vic Ash who died on the 24th of October was a major figure on the British jazz scene from the early 1950’s onward and a member of the BBC Big Band for almost 20 years until 2007. 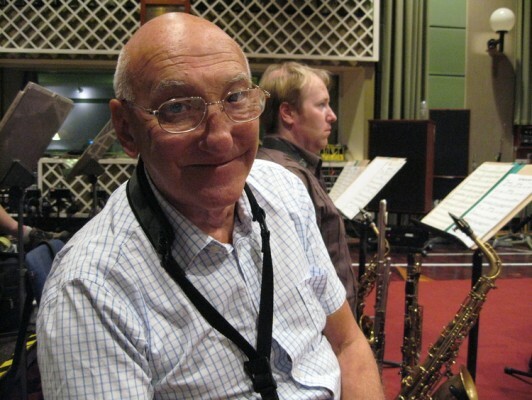 Martin Williams, who sat alongside Vic in the saxophone section remembers a great musician and unforgettable character……….. I started playing with the BBC Big Band in 1998, when I was 24, and Vic Ash was 68. You would have expected the veteran with nothing to prove to view the over-confident young upstart with derision, but that was a long way from how he welcomed me and many other young players to the band. He immediately took me under his wing, and as a result, made the years I spent sitting next to him some of the happiest and most fruitful I’ve had as a musician. I, of course, was in awe of the legendary older statesman of British jazz. Establishing himself at the very beginning of what we now recognise as the defining period of jazz and popular music, Vic worked his way up from his childhood in the East End of London- where he remembered watching the Battle of Britain and witnessing Oswald Mosley’s marches. He started out as a women’s underwear salesman whilst playing jazz part-time, and quickly became one of the most in-demand woodwind players on the scene. He was winning polls as best clarinet player as early as 1950, becoming one of the first British players to play be-bop on the clarinet, in addition to his long-time mastery of the tenor saxophone. Although self-deprecating of his own achievements, he encompassed virtually every aspect of the freelance doubling woodwind player: recording sessions, backing innumerable British and American star singers, television shows, West End shows, and of course, his primary love, playing swinging mainstream jazz, which he took out on the road for over sixty years. I sat next to Vic in the sax section of the BBC Big Band for over ten years, and apart from the hundreds of stories which he had to tell, what I will remember him for is the unfailing warmth and camaraderie he brought to the section. When Vic was there, everything was great; every other (significantly younger) member of the saxes thought, “If it’s good enough for Vic, it’s certainly good enough for me”. We all knew he had played a million sessions, played with a million different sax sections, had seen every situation before, and yet I never remember him once being tired, bored, or frustrated. He loved sitting in the section. Howard McGill and I sat either side of him. We had many years of gently ribbing him about all sorts of things; Vic would turn around to tell Howard one of his many stories, and I would use the diversion to turn his mouthpiece upside-down. By the time he had finished his story, the red light would be on and we’d be recording; Vic would then try to play a few notes on the upside-down mouthpiece, then fumble around to get it back into position. I must have done that a few hundred times over the years. Vic was in his element in swinging jazz. When he stood up to play, it was supremely confident, always swinging JAZZ. He knew what he could do, and he always delivered a great solo. He also knew what he could not (or rather, didn’t want to) do. He was much more comfortable playing standard chord sequences at medium tempos. He would always arrive at the studio early, and look through the parts on the stands. He played the Tenor 1 chair, I played the Tenor 2; however, the jazz tenor solos are often put on either chair. He would select the solos he wanted to play, then amend the instrument title on the part. By the time I arrived, the medium tempo standard chord solos and blues would have “Tenor 1” on the top, and the awkward keys, funny time signatures, and up-tempo solos would have “Tenor 2”. The BBC library has a great Steve Gray chart on Shine, at a very fast tempo. It’s a tenor battle, where both tenor saxes are featured for the whole chart. Of course, being Steve Gray, nothing is ever that simple; the piece changes key frequently, and in fact one tenor plays in the very straightforward key of Eb, the other tenor plays in the finger-bending key of A. Guess which part Vic had! Of course he always wanted to sound great, which by hook or by crook, he always did– but maybe he should have pushed himself more. In a library as eclectic as the BBC Big Band’s, there were always situations where he couldn’t make himself comfortable, and had to tackle something he found awkward, yet even in those situations, he STILL sounded great. There were so many great times with Vic, I can’t even begin to put them all down. But one or two spring to mind: We were playing a piece written by a guest conductor which had the sax section all playing very long phrases on the clarinet with almost no space to breathe. There was a one minim rest towards the end of the chart. Having played the clarinet for two or three minutes without rest, during the two seconds’ rest, Vic uttered the phrase “Oy vey!”, then carried on playing. Howard and I, sitting either side of him, were then doubled up in laughter for the remainder of the piece, while Vic soldiered on, oblivious. Vic would always bring an apple and some almonds as a snack. During a break in rehearsals, in an otherwise empty studio, the singer Mark Murphy was playing the piano and singing– and it was a beautiful rhapsodic performance, full of passion and eloquence. To Vic, it was a break. He proceeded to unpack his apple, and then to eat it in the loudest possible manner, completely oblivious to the beautiful music going on around him. I’ll remember Vic firstly as a great person to sit next to for all that time. He was one of those characters who brings a huge amount to any situation just by being there– before he’d even played a note. I really missed him when he left the band, and I’m going to miss him even more now.